Sitges is a town of approximately 25,000 people and is located about 30 km south of Barcelona. Originally occupied by the Romans on a defensive headland looking out to sea, Sitges� port was used to trade products from the Pened�s region and other places from the Roman Mediterranean. With the arrival of Santiago Rusi�ol in 1891 - one of the architects of Modernism - Sitges became the cultural centre of the modernists. In 1909, Sitges was visited by Charles Deering, a North American millionaire who converted a street in the historic core into a palace, the Palau Maricel. This palace and Rusi�ol�s residence helped launch Sitges to tourist fame. In 1918, the Terramar garden city and the Passeig Maritim or Esplanade were constructed. Atracci�n de Forasteros (Tourist Attraction Company) was created in 1928 and the Tourist Information Office in 1934. From then on, Sitges would become a European tourism standard setter. The Butler Model: what is it looking at? In Geographical terms, a model is a simplification of reality. The purpose of the Butler Model is to look at the way that tourist resorts, grow and develop. The tourist industry, like all industry, is dynamic and constantly changing. Therefore, the Butler Model is a way of studying tourist resorts and seeing how they change over time and in relation to the changing demands of the tourist industry. These changes can then be compared to the predictions as shown on the model. The Butler Model (see Figure 2) breaks down tourist development into five distinct stages. A settlement is 'explored' or 'discovered' by a small number of people who later tell others about their experience. In time other people visit and local people seize upon the new economic opportunities provided by these visitors and provide services to meet the needs of these visitors or tourists. More tourists arrive having heard about the place by word of mouth, articles in Travel Supplements in papers such as The Sunday Times, brochures or tourist guides. The extra tourists attracted by the publicity and people willing to visit somewhere new will lead to the building of new hotels, restaurants, shops and services to cater for the influx of people. As more people visit the resort, the facilities are now fully utilised. At this stage mass tourism replaces what was once the original economic function of the settlement. This may cause some resentment with people in the town who have not benefited from the new industry or from the loss of distinct identity that the settlement held before. It may appear that the local culture is being diminished by a more international and non-unique culture compared to what may have existed before. Popularity may be short lived. People may become bored with the resort once its initial appeal had waned. Little of the original natural environment will remain and negative comments about what it used to be like may lead people to find somewhere new to discover. The effect of falling tourism if a resort goes out of fashion leads to economic decline and the under-utilisation of tourist infrastructure. The eventual closure of some of the businesses will lead to a rise in unemployment. The tourist resort then has two options; either go into decline or rejuvenate and develop more sustainable strategies based upon lower visitor numbers. Sitges was discovered early by people from the city of Barcelona. It later began to attract many artists and intellectuals such as Rusi�ol. Many wealthy Catalans also built second homes in Sitges to escape a much polluted Barcelona. Much of the early wealth of Sitges was based on trade with the West Indies and Cuba in particular. The houses on the southern part of the Esplanade reflect this Cuban influence. The local tourist industry remained in place until the developments of the 1960's when tourism from overseas first began to filter into the town. The development of the package holiday whereby passengers booked flights, transfers and accommodation all in one booking made places such as Sitges accessible to people from Northern Europe. Furthermore, the use of jet aircraft made such perceived epic journeys now possible in under half of a day. 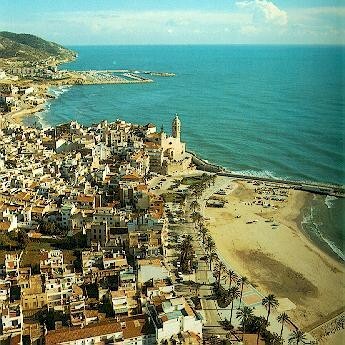 Sitges responded to these developments with the construction of large hotels such as the Terramar and Calipolis on the sea front. Other smaller hotels were also built, often in converted Cubanesque houses. Restaurants, shops and bars also opened to cater for the needs of the increased number of tourists who visited in the main season extending from mid-May until the end of September. Sitges is now a major tourist resort, perceived as high status and catering for more affluent visitors. It has a wide range of 36 hotels and 12 pensions, totaling 2,540 rooms. It is popular with the gay community, many of whom holiday in Sitges during the summer season. This has added to the success of the town and is further reflected in the range of high status shops and restaurants found there. There are over 150 clothes shops and 175 bars and restaurants, four times more than expected in a town the size of Sitges. Sitges has also attracted many migrants not just to work in the tourist industry but also others to live in the town. These include wealthy people from elsewhere in Spain, as well as others from around the world. The migrants comprise of 63% from Europe and 30% from Latin America. Many of the Europeans are living permanently in Sitges while others own second homes in the town. Proximity to Barcelona airport and the advent of low-cost airlines such as Easyjet and Ryanair have been an added boost to Sitges in attracting people on short breaks. Today large numbers of the tourists are independent travellers, making all of their own holiday arrangements via the internet rather than using a High Street travel agency. This has been especially important since the economic downturn as the majority of visitors are here for short breaks only. Tourism trends change. Many of the early tourists to Sitges now looked for cheaper alternatives to places they may have visited before or become tired of. New resorts opened as the Mediterranean countries of Greece, Turkey, Cyprus and others developed their tourist potential and more established resorts such as Sitges saw a fall in their traditional client base. This phase saw holiday companies such as Thompson remove Sitges from their holiday brochures. The fall in the traditional tourist base has led Sitges to try to develop more sustainable strategies. Many environmental improvements are in progress and the resort has been rebranded as an all-year destination. To this end the calendar of events that Sitges offers extends well beyond the traditional holiday season. The calendar below illustrates some of the activities on offer in 2011. March 3 -9 Carnival with parades on Sunday 6 and Tuesday 8. The extension of the season has been promoted with the production of a DVD with the theme 'Sitges the art of living'. This appeals to high income professional groups to make Sitges a permanent base for multiple short breaks in the Mediterranean sun. Sitges has capitalised on its proximity to Barcelona to become one of the main destinations for Business and Conference tourism in Catalonia. Its specialised hotels in this sector include the Dolce Sitges, with over 30 meeting rooms and the Meli� Sitges, with a conference hall seating more than 1,300 delegates and 16 meeting rooms. Furthermore, the Sitges Council is embarking on a project called 'QUALIA Sitges' to enhance tourism by exploiting what is called the 'creative economy'. This refers to the development of activities relating to creativity, art and culture which will compliment Sitges' tourist based economy. It aims to build upon the earlier role of Sitges as a centre of art and culture based upon the works of the artist Rusi�ol in the late nineteenth and early twentieth centuries. It aims to encourage and promote cultural and artistic tradition with new technology. The project is a long term plan covering the next ten years and will see the development of a state of the art campus with a school of music and dance, a University of the Performing Arts and a Design Centre. These facilities will bring in to Sitges up to 2,000 students a year as well as a further 2000 jobs including academic staff and other professionals working in the QUALIA facility. It has been estimated that each student will spend approximately 750� per month in Sitges of which 150� will be on tourist and leisure facilities. Added to this are the family and friends of the students coming to see them who are expected to add a further 25,000 guest nights in Sitges and the use of the town's tourist facilities. Therefore, Sitges can be seen as moving forward in its plans to remain a major leisure destination by diversifying to ensure long term sustainability. Calafell, like Sitges, benefited from the opening of the railway line but because of its greater distance from Barcelona, there was very slow development until a huge speculative boom in the 1970's. Developers constructed hotels and apartments to take advantage of the resort's greatest asset - its long and wide beach. The construction of the promenade and the completion of the sea front apartments and hotels attracted families from Madrid and northern Spain, particularly in the summer months. New businesses opened to cater for the needs of these people. The 5 km stretch of coastline comprising the beach resort of Calafell became fully occupied during the high seasons of the 1970's and 1980's. However, Calafell never attracted the package tour operators in the way that Sitges has done and the range of hotels is very limited. The speculative boom of the 1970's and 1980's resulted in the destruction of nearly all of Calafell's original seafront. The fishing cottages were replaced by an endless row of 6-storey apartments facing the sea. As a result, the seafront lacks character and charm and with the economic crisis and competition from other resorts in Spain and overseas, the number of hotel rooms has decreased by 17% in the last decade (from 1,690 in 1996 to 1402 in 2006). The immigrant population now represents 20% of the total population of Calafell, having grown rapidly in recent years. However, Calafell has not attracted large numbers of wealthy people from elsewhere in Spain and Europe in the way Sitges has. Instead, approximately 50% of the immigrants are from North Africa, settling in the area of Segur de Calafell. Calafell thus seems to be in stagnation or decline mode. Like Sitges, the fall in the traditional tourist base has led Calafell to try to develop more sustainable strategies. Many environmental improvements are in progress and the resort has been rebranded as an all-year destination. However, tourism in Calafell has taken a rather different path to Sitges. The family-orientated nature of the resort has been promoted, with Calafell earning the 'Family Holiday Destination certificate' from the Catalan government in 2007. This recognised the family-oriented accommodation, restaurants and a range of leisure activities provided. Calafell has a Children's Club in the summer months and, like Sitges, has a tourist train running along the sea front and a second linking the beach area with the historic core inland. Calafell has helped pioneer the trend for more active holiday pursuits and in 2008 became the first resort in Spain to offer Nordic walking. This, together with trekking and mountain biking are provided free of charge, with certified guides. However, despite adopting the slogan 'Calafell tot l'any' ('Calafell, all year'), the resort has struggled to extend the tourist season as effectively as Sitges. Calafell's 2009 Municipal Urban Plan (POUM) seeks to stop the uncontrolled urban growth of the town, protect the natural and historical heritage and maintain and enhance the tourism that forms its economic base. Calafell needs to widen its tourism offer and new economic activities need to be attracted to diversify its economy if it is to avoid becoming a dormitory town for Barcelona. It can therefore be seen that both Sitges and Calafell cater for tourists but are two very different towns. The proximity of Barcelona has enabled Sitges to grow much more rapidly and diversify its tourism more effectively than Calafell with the result that the two towns have developed and evolved in different ways. The study involves visiting both towns and collecting data at five comparable locations in each town. These are the old historic core, the sea front, an area of historic buildings, a major shopping street and an entertainment street. Data will be collected at each site and later used to compare the two towns in relation to the Butler Model. Students will be expected to prepare a presentation of their findings and recommendations as to what could or should be done to improve the tourist facility or experience, if deemed necessary.